There are a wide variety of coat colours and patterns. The Mink pattern is the result of having one gene for the Burmese solid pattern and one for the Siamese pointed pattern. Breeding between 2 Mink patterned cats will generally produce half mink kittens, quarter pointed kittens and quarter solid kittens. A pointed and a Solid bred together will always produce all Mink patterned kittens. A Pointed bred to a Mink will produce half pointed and half mink kittens. A Solid bred to a mink, will produce half solid and halk Mink kittens. playful but not hyperactive. They are naturals at inventing and playing games. They use favourite toys to play fetch and hide n seek is a favourite game. they are easily cared for.They need a well-balanced feline diet, weekly nail cliiping and vet check up. working families may find 2 Tonkinese will keep each other company throughout the day. Toys and a cat tree may lessen the mischief they may get into while there is no supervision and boredom kicks in. often play fetch and can often be found perched on the highest item in the house. love to take possession of your lap or sit on your shoulder and supervise your activities. Often described as part puppy as they follow their owner around the house, part monkey as they perform acrobatics and part elephant with the noise they make as they run through the house. will happily greet any guests and will greet you at the door on your arrival home. more like the Burmese in temperament than the Siamese- less high strung and less demanding. 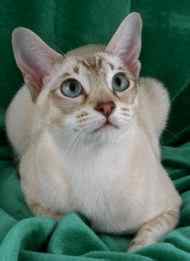 Tonkinese have a modified wedge-shaped head, with large ears set towards the outside of their head.